W. W. Norton & Company, 9780393058093, 670pp. Nikita Khrushchev was a leader who risked war to get peace during the most dangerous years of the twentieth century. In Khrushchev's Cold War, Aleksandr Fursenko and Timothy Naftali, authors of the Cuban missile crisis classic "One Hell of a Gamble," bring to life head-to-head confrontations between Khrushchev and Presidents Eisenhower and Kennedy. 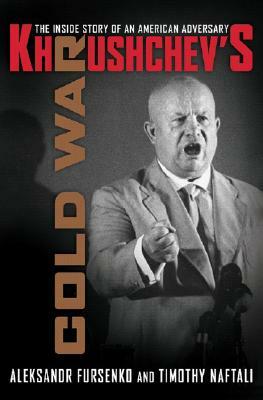 Drawing from their unrivaled access to Politburo and Soviet intelligence materials, they reveal for the first time three moments when Khrushchev's inner circle restrained him from plunging the superpowers into war. Combining new insights into the Cuban crisis, startling narratives on the hot spots of Suez, Iraq, Berlin, and Southeast Asia, and vivid portraits of leaders in the developing world who challenged Moscow and Washington, Castro, Lumumba, Nasser, and Mao Khrushchev's Cold War provides one of the most gripping and authoritative studies of the crisis years of the Cold War.